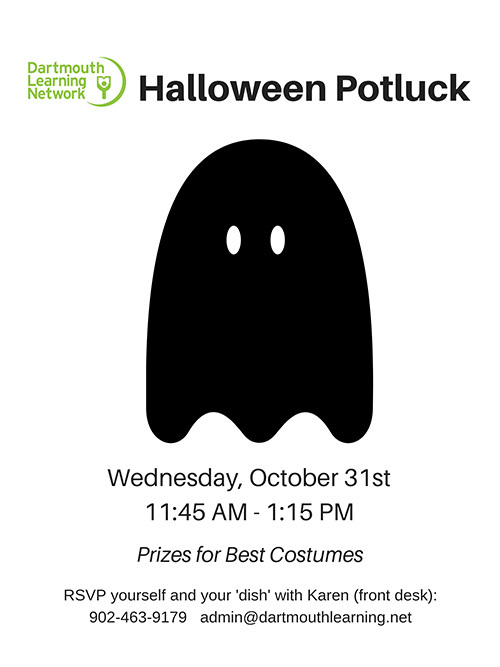 Dartmouth Learning Network volunteers and learners are invited to join us on Wednesday, October 31st from 11:45 am - 1:15 pm for our annual Halloween Potluck. Bring your favorite dish to share and (if you choose) wear your favorite costume or Halloween attire. Prizes will be awarded for best costume! Please let Karen know if you plan to attend and what meal you plan to bring. Karen can be reached at 902-463-9179 or via email at admin@dartmouthlearning.net.